One month ago, this precious little girl who made us parents, turned 2. There is so much I could say about the past 24 months. She has changed our life forever and for the better. Almost everyone she meets is amazed at how easy going, sweet and thoughtful she is; from the way she can sit still through a sermon, to the goodnight hugs she shares with those whose home we happen to be sleeping in that night (within reason), to the way she notices things that are out of place and picks up after herself and others. She’s very shy when she first meets you but if she can sit with you and play for a bit you’ll see she’s dramatic and expressive. One of her favorite phrases and a favorite of those who know her is, “oh no!” (which she says emphatically for some of the smallest things). Arianna is pretty amazing and brings us tons of joy. But lest you think we’re just the perfect happy family I’ll admit it’s not been without bringing challenges to our life as children tend to do! One of the challenges we’ve had since Arianna entered our life has been getting more than a couple consecutive hours of sleep. Thankfully Arianna started her 2nd year off right, with 9 consecutive hours of sleep the night before (for the first time in her life) making it a happy birthday indeed! We celebrated her actual birthday with a family date. Some highlights included when she literally made a new friend at Build-A-Bear Workshop, a visit to Chick-Fil-A for lunch and play time, and some fun in our home made photo booth to get it warmed up for her party (the backdrop will provide a subtle hint for the party theme)! A few days later, we had a party to celebrate her life with extended family. So about the party… I am one of those moms who thinks about her child’s party for weeks in advance, plans out all the details, and generally goes a little above and beyond what some may deem necessary. This time around I realized that planning her parties basically becomes my hobby for that month prior because it’s a creative outlet for me. It’s one way the artist in me expresses itself, so while I can let my perfectionism get in the way at times, it is something fun for me to do. For those of you who are bent that way, I’ll include some of the details. If you could care less, you can feel free to skim those comments or just browse the pictures! This year Arianna was a little more involved in choosing the theme of her party. Some months ago she discovered Elmo and he has become one of her favorite characters. Her love for the furry little red guy is a newer thing that’s developed this past year but her love for music is something she’s had since we can remember. So, we combined the two and had a Sesame Street theme with Elmo’s band as the centerpiece! 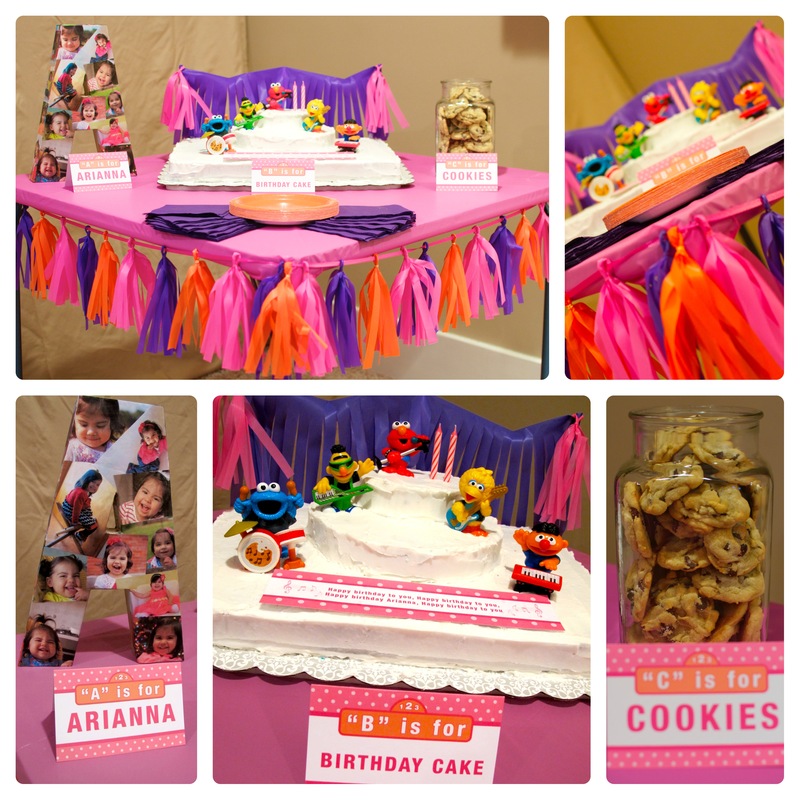 Her cake table featured an “A” for Arianna that was covered in my favorite snapshots of her from age 12-24 months. This was easier to do than I thought and I felt extra motivated to make it since it is something nice enough to keep well after the party. The “B” was for birthday cake of course. 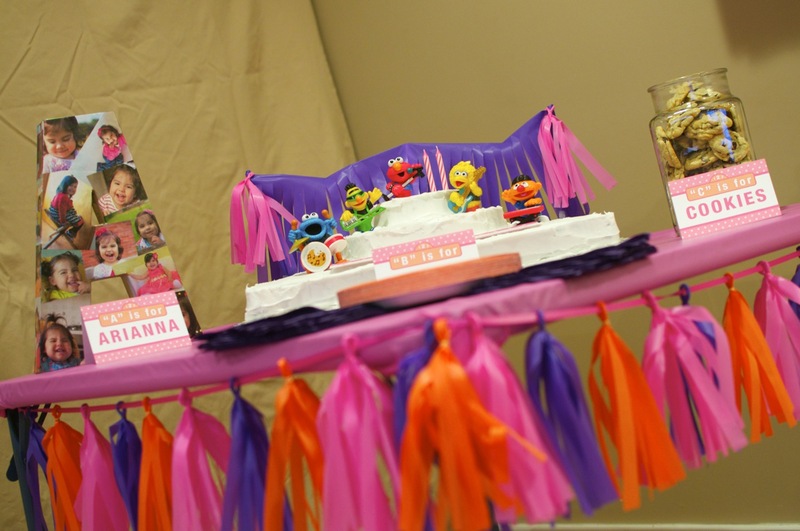 My vision for the cake was that it was a stage where Elmo and his Sesame Street band would be singing “Happy Birthday” to Arianna. Arianna’s Grandma (my mom) actually made the 3 tiered cake so it not only looked fun but tasted great. To top it all off (pun intended) I love the characters I found which were cake toppers because they are toys Arianna can play with all year long! We rounded out our “ABCs” with the Sesame Street band drummer’s favorite treat: “C” for cookies, which were also home made by Arianna’s Grandma (my mom). Lastly, I spent more time then expected creating the garland that hung around the edges of the table, but I love how it turned out. It was made out of plastic table cloth so it was cheap, will be durable enough to use again, and left me with bigger pieces for other table tops at the party. 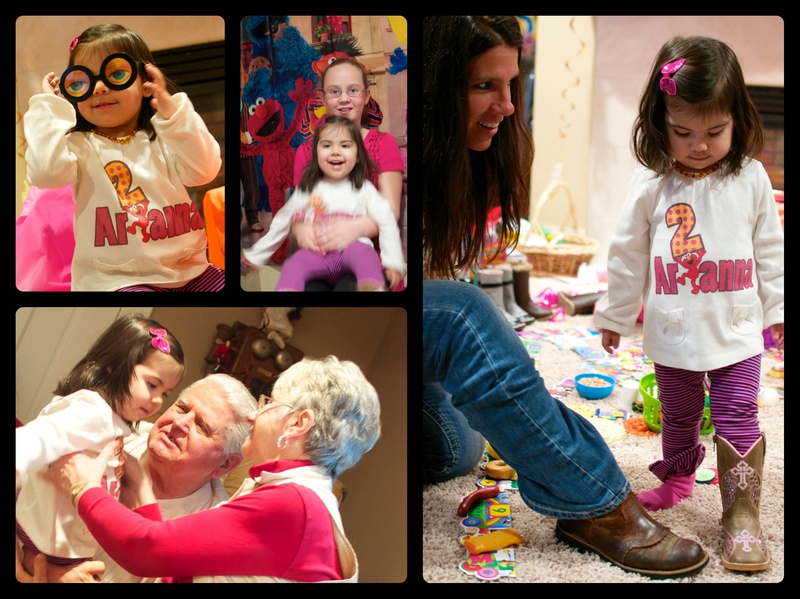 The party girl herself was dressed in an Elmo shirt we designed and had made as a gift to her. She sat front and center by the gift table (which family generously filled). 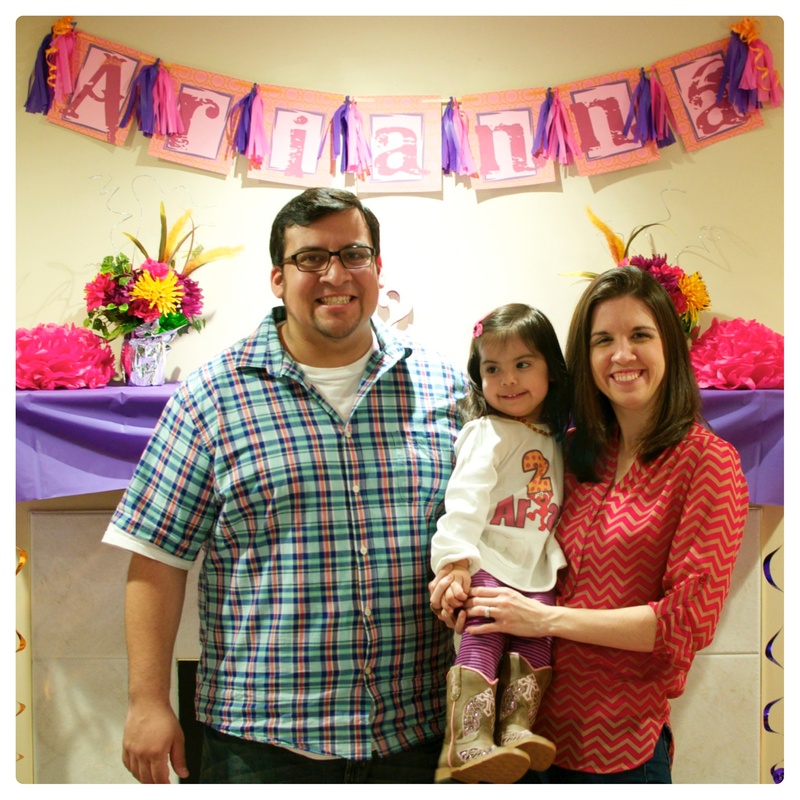 Above her was a banner I was able to make using a design Jon created when she was born combined with the garland. The flowers were actually arrangements that my mom had at Arianna’s baby shower so it was fun to add some pink and repurpose them! The paper flowers were decorations her Great Aunt and Great Grandma made for her 1st birthday which were fun to pull out again. The glittery “2” was the only thing that was brand new so I was excited about how inexpensive it was to make that space beautiful and extra special. 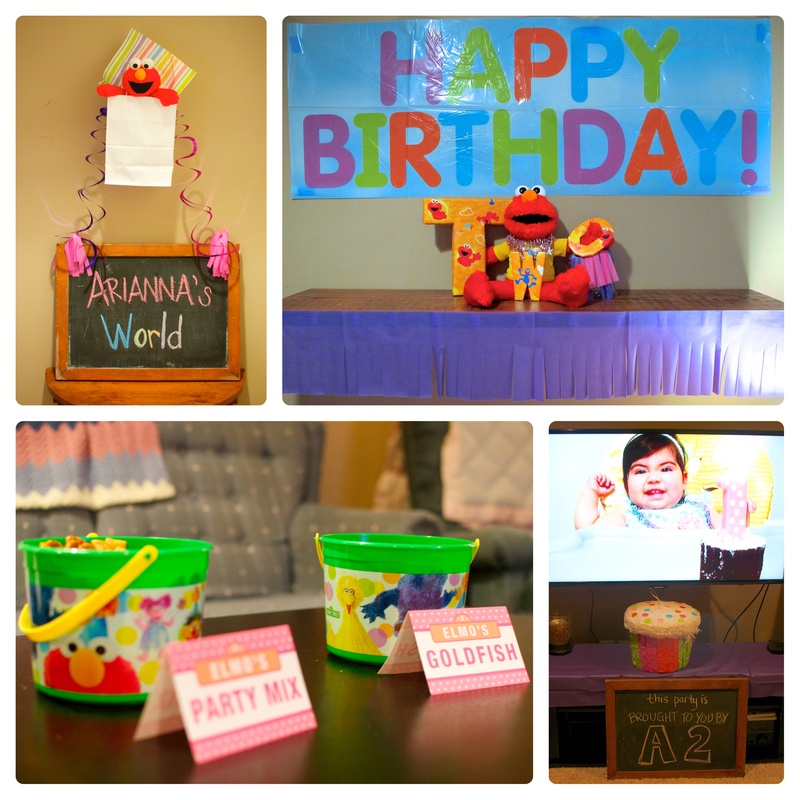 Some other touches around the room were an ode to “Elmo’s World,” one of Arianna’s Elmo dolls holding letters wrapped in Sesame Street paper announcing her new age, goldfish snacks because Elmo loves his fish Dorothy, and a video slide show of all our favorite pictures during the last 12 months. 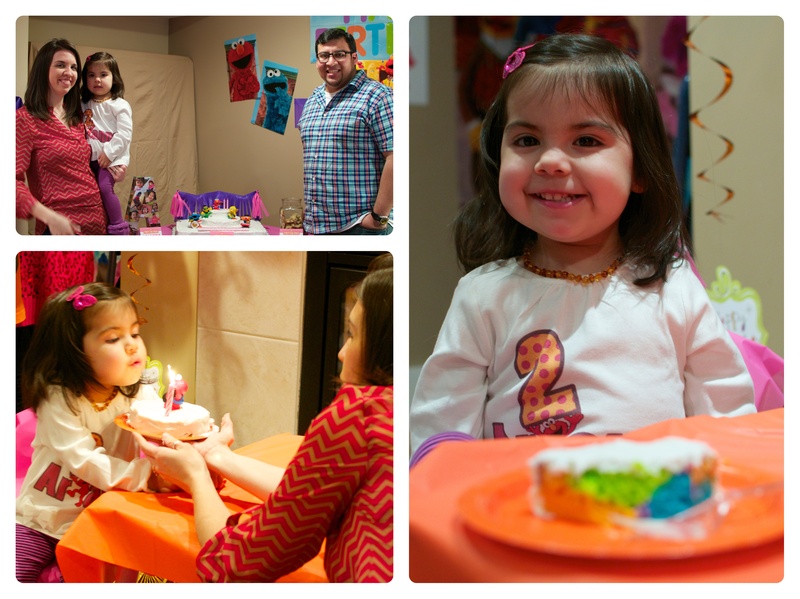 It was fun that Arianna actually understood how to blow out her candles this year. She not only liked seeing Elmo on top of her little cake but per her request for a “rainbow cake”, Grandma made it tie dyed on the inside and she loved it. It was an unexpected blessing to be in the States again where we could celebrate with family and that we did! We got them all actively involved in the festivities by convincing them to jump in for photos in our home made photo booth. 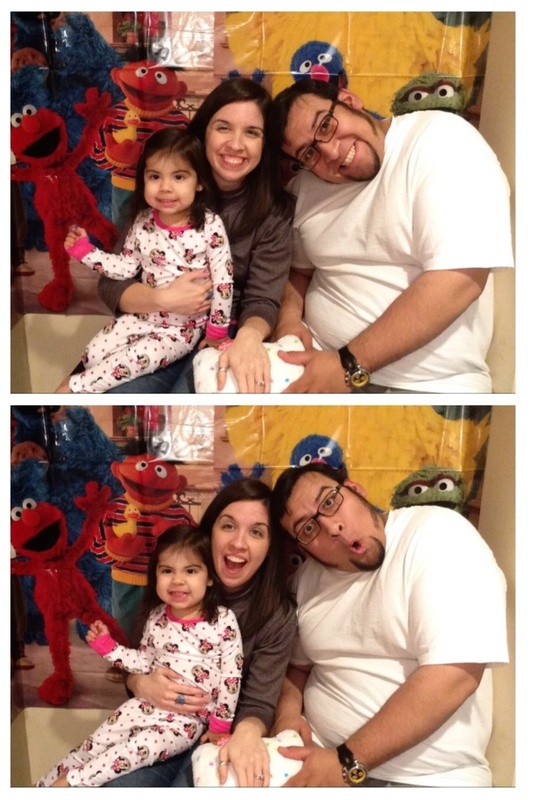 We found a great inexpensive Sesame Street background that Arianna loved so we now have lots of fun pictures with her family and fictional friends! Here are some other special moments: when Arianna tried on one of the favorite photo props, lots of fun with cousin Lexi in and out of the “photo booth”, trying on one of four pairs of adorable boots she got to last her the next couple years, and the sweetness that it was to have her Great Grandparents there especially since her G. Grandpa recently had some major heart surgeries! We love our little girl like crazy and are so thankful God has given us the privilege of being her mommy and daddy. Each year we choose a verse to be something we intentionally pray over her and teach her (while reminding ourselves). This year we are living in the midst of lots of uncertainties and so we felt it fitting to give her Matthew 6:30 which reads, “if God cares so wonderfully for wildflowers that are here today and thrown into the fire tomorrow, he will certainly care for you” (NLT). It’s a passage that exhorts us to turn our gaze from temporal to eternal things and to trust and seek God first no matter our daily struggle. May God help us to do that as her parents, including entrusting Arianna to God, despite the many worrisome things to come this year. I’ll wrap this up with some of our favorite formal photos we took to capture Arianna at 2 years old. She wore her “Cinderella dress”, a lovely gift from her Uncle and Aunt, even on a frigid February day thanks to a friend who let us borrow her indoor studio. Like the dress, she leaves a little sparkle everywhere she goes! 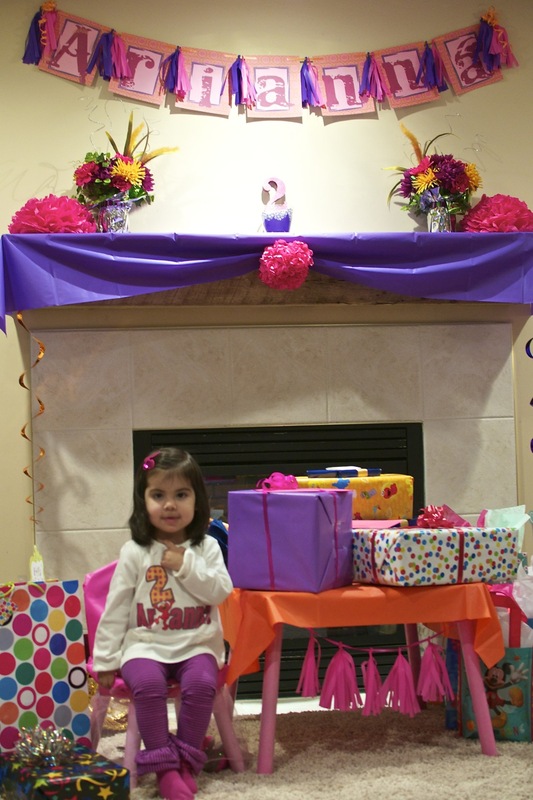 Happy 2nd Birthday, Arianna! Looks like you had a blast! Love your princess dress!